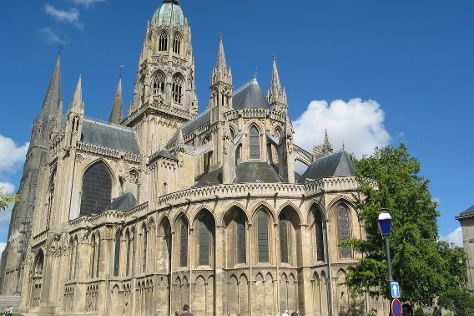 Kick off your visit on the 2nd (Mon): contemplate in the serene atmosphere at Notre Dame Cathedral, learn about all things military at Museum of the Battle of Normandy, then admire the masterpieces at Musee de la Tapisserie de Bayeux, and finally steep yourself in history at Remains Mulberry Harbour. To see where to stay, maps, and more tourist information, go to the Bayeux road trip tool . Rio de Janeiro, Brazil to Bayeux is an approximately 18.5-hour combination of flight and train. You can also fly. You'll lose 4 hours traveling from Rio de Janeiro to Bayeux due to the time zone difference. Traveling from Rio de Janeiro in September, expect Bayeux to be a bit cooler, temps between 24°C and 13°C. Wrap up your sightseeing on the 2nd (Mon) to allow time to take a train to Paris. Kick off your visit on the 3rd (Tue): admire the masterpieces at Musee d'Orsay, then admire the striking features of Basilique du Sacre-Coeur de Montmartre, and then take a stroll through Montmartre. On the 4th (Wed), you'll have a packed day of sightseeing: admire all the interesting features of Eiffel Tower, pause for some photo ops at Arc de Triomphe, and then explore the world behind art at Louvre Museum. To find more things to do, reviews, ratings, and tourist information, read Paris trip itinerary builder app . Take a train from Bayeux to Paris in 2.5 hours. Alternatively, you can drive; or take a bus. In September, daytime highs in Paris are 24°C, while nighttime lows are 13°C. On the 5th (Thu), wrap the sightseeing up by early afternoon so you can travel back home.